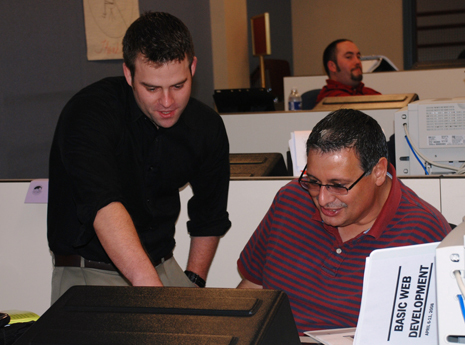 Dave Cullinan, the newly-appointed Assistant International Representative for Unit 46, spent the week of July 13 at TCU headquarters in Rockville honing his skills in membership representation. Seen above in the center, he studied with Industry Relations Executive Director Debbie Horrell and IR Director Darwin Kubasiewicz. From left to right: front row–Instructor Gene Morrill, 894 LC Emil Moawad, 905 LC Sara Wolfe, 6850 LC Mike Aldridge, 5088 GC Rick Luck, 6673 LC William Monkman, 6465 LC Mark Roberts, 6787 LC Richard Shrader, 43 LC Charlotte Boldt and 146 LC Wayne Anderson; Row 2–6034 LC Matt Allen, 781 LC Vince Rogers, 5093 GC Larry Volten, 867 LC James Peters, 6748 LC Tim Falsetto, 6318 LC Mike Nitschke, Carmen Div. GVP Carl Tingle, 6088 LC Louis Kamber and 5058 GC Stephen Serra; Row 3–6846 LC Ramon Baca, IR Stan Boyd, 6731 LC Jason Cox, IVP Joel Parker, 6060 LC Kenneth Cooper, IR Jack Wright, 1090 LC Mike Divers, 6724 LC Randy Mothershead, AIR Roger Cain, 6205 LC Dennis Wilson, 234 LC Charles Litten, 6354 LC Lewis Smith, 1351 LC Chad Trainer, 187 LC Walter Tuccini, 6085 GC Joe English, IVP Russ Oathout, 6277 LC Mike Kennedy, IR Danny Lancaster, Carmen Div. AGP Marvin Napier, IR Don Grissom, AIR Rob Lee, Crmen Div. GVP Alex Novakovic, 1461 LC James Hennen, 6633 LC Norman Barnett and Program Coordinator Darwin Kubasiewicz. Seen from left: front row—Kevin Chandler, 1218 Local Chairman; Int’l. Pres. Bob Scardelletti; IR 250 Ron Kloos; Frank Bernal, 2500 LC; Carmen Div. Pres. Rich Johnson; and Alphonso Jenkins, 1043 LC; second row—Susan Dunton, TCU Communications; Carmen Div. Asst. Pres. Marvin Napier; Carmen Div. GVP Carl Tingle; Ronald Watkins, 6078 LC; Doris McCarthy, 2505 LC; IVP Joel Parker; and IAM Transportation VP Robert Roach; third row—IVP Russ Oathout; Ind. Rels. Dir. Darwin Kubasiewicz; Kimmie Price, 228 LC; Alfredo Alvarez, 938 LC; Ron Davis, 1220 LC; Lawrence Albano, Local 861; Christy House, 2508 LC; Mike Schultz, 6294 LC; Benny Keifer, 6747 LC; fourth row—James Lay, 6887 LC; IR 86 Larry Jones; Odis Tillis, 6721 LC; Rufus Humphrey, 938 VP; Alfred Coleman, 6364 LC; Jeff Hunt, 724 LC; Carmen Div. GVP Alex Novakovic; Justin Miller, 6670 LC; Tory Smith, 6832 LC; Blake Barnette, 6178 LC; Ed Floody, 1472 LC; David Newkirk, 6005 LC; Tom Sherman, 6713 LC; and Stuart Smith, 5517 District Chairman. 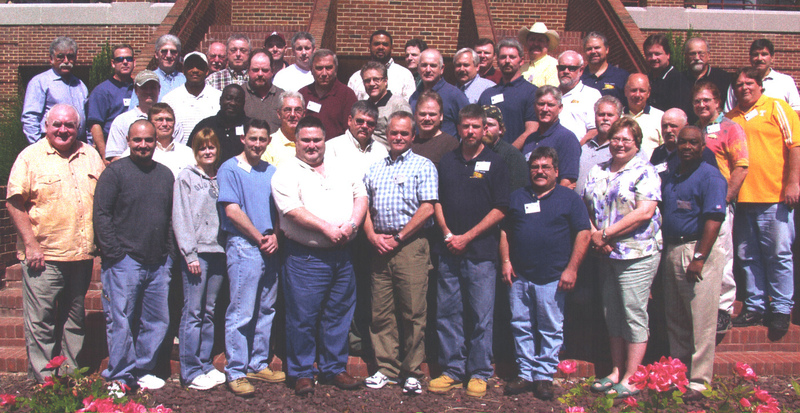 April 18, 2008—The third joint training seminar for local leaders closed today after a week filled with information and opportunities to meet with the top leaders of both TCU and the IAM. 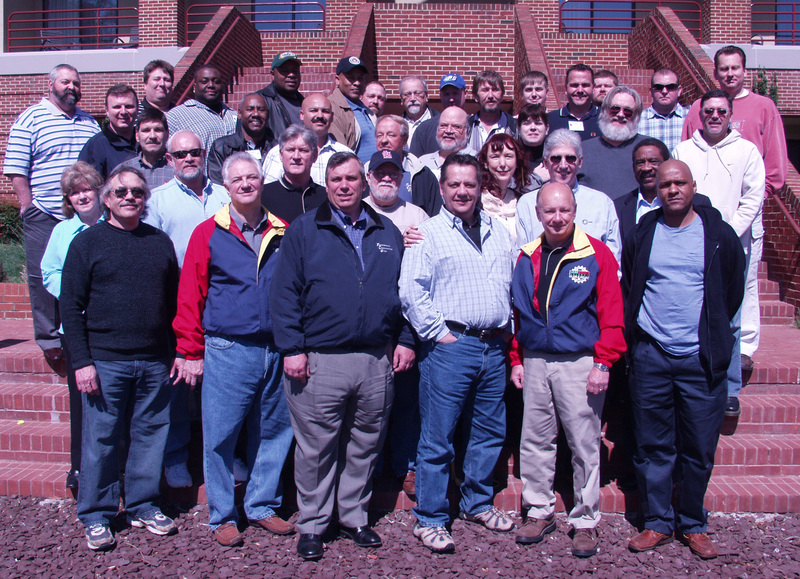 The weeklong Railroad Local Chairmen Training Seminar began Sunday, April 13, at the William W. Winspisinger Education and Technology Center at Placid Harbor in Southern Maryland. Leading off that day was International President Bob Scardelletti, who spent a good part of the week there with the representatives. 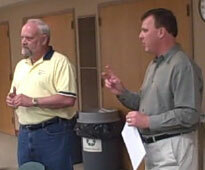 IAM International President Tom Buffenbarger spoke to the group, as did Carmen Division President Rich Johnson. Key courses focused such skills as gathering and presenting proof and evidence in arbitration, grievance writing, and conduct of a disciplinary hearing. Participants also reviewed issues including the Railway Labor Act, FMLA, human rights, the Federal Railroad Administrtion, organizing, the legislative scene, among many in the jam-packed schedule. 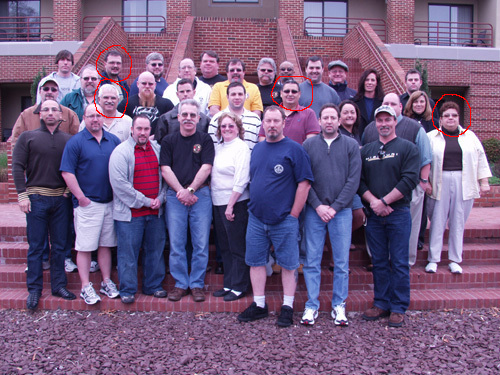 Circled are TCU’s reps: from left is Lodge 6088’s Danny Garner from Kentucky, Lodge 1295’s Thomas Jackson from Georgia, Lodge 2507’s Eugene Rangel from Texas, and Lodge 1043’s Jeanette Suarez from New York. of developing a website to communicate with local lodge members. Carmen Division Assistant General President Marvin Napier and International Vice President Russ Oathout (seen in photo at right) joined the group to speak about current TCU matters. 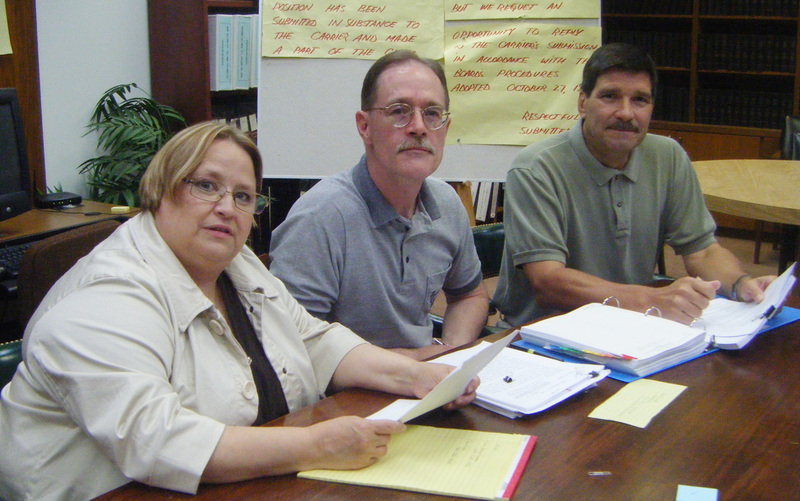 The reps were Local 6088’s Danny Garner, Local 1295’s Thomas Jackson, Local 2507’s Eugene Rangel and Local 1043’s Jeanette Suarez. Those four TCU reps were among nearly 30 IAM members from across the U.S. and Canada who got a crash course in web development at the IAM’s William W. Winpisinger Center in Hollywood, MD during the week of April 6. In addition to learning cutting-edge web and graphic design techniques, participants went home with a fully functioning website for their locals. “I’m looking forward to learning more and developing a local website so our members, who are spread over a 200 mile radius, can stay updated,” said Danny Garner of Lodge 6088. Joining their IAM brothers and sisters at the Winpisinger Center recently were six TCU local leaders: Rufus Davis, Lodge 5087 from Wilmington, DE; Ola Mae Jones, Lodge 1295 Local Chairperson from Conyers, GA; David Lang, Lodge 6139 Local Chairperson from River Ridge, LA; Patricia Ann Lee, Lodge 697 President from Jacksonville, FL; Johnny Long, Lodge 6060 FST/Recording Scretary from Trussville, AL; and Rex Winegar, Lodge 6046 FST from Debary, FL. 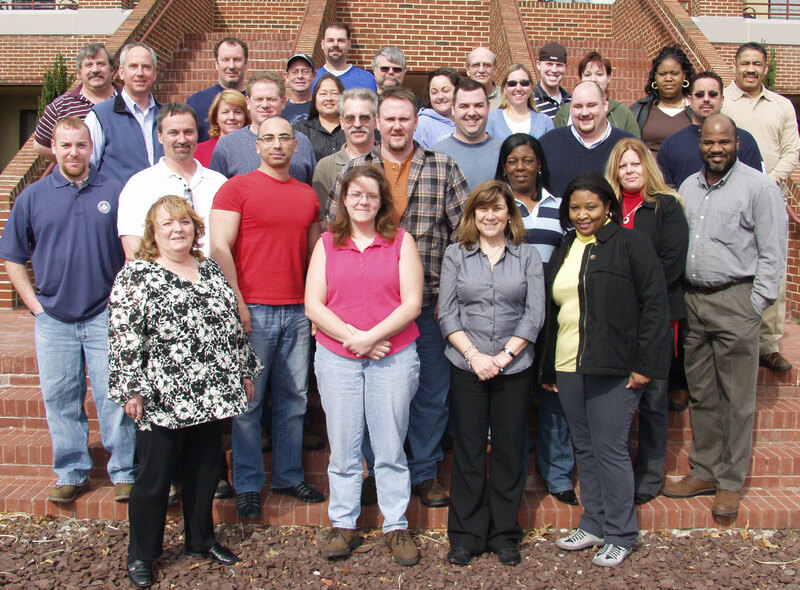 The group spent the week at the Machinists’ education center in southern Maryland studying ways to improve communications with their memberships. They also had a chance to hear from International Vice President Russ Oathout (at rt. in the photo) and Carmen Division Assistant General President Marvin Napier during a breakout session. 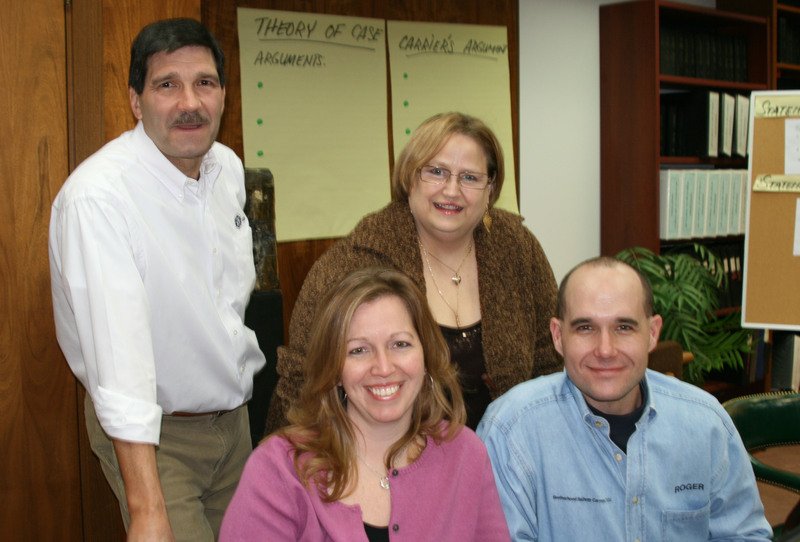 January 14, 2008—Kelly Gilbertson (seated left) of Unit 46 and Assistant International Representative Roger Cain (seated right) of Unit 200, spent the week of January 14 in Rockville, Maryland, working to develop their skills as briefwriters. Teaching the seminar were (standing) Industry Relations Department Director Darwin Kubasiewicz and Executive Director Debbie Horrell.